Make Scrapbooks, NOT dinner. 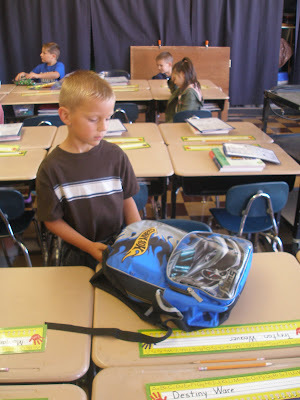 : Back to school...FIRST GRADE! We had "Meet your Teacher" yesterday afternoon and we were so excited to see Treyton's name on Mr. Pennington's list of students. I was so shocked. Shouldn't have been. 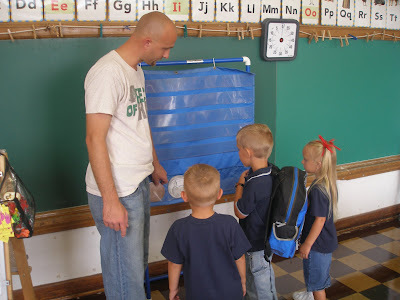 I felt again this year that God wanted me to leave my hands off of the teacher thing and let Him take care of it. So I did - was kind of hard. You see, Treyton wanted Mr. Pennington to be his teacher so bad and so I wanted to just go in and request that Treyton be in his class. And I could have - but didn't because of the real feeling that God wanted to take care of it. And He did. What an amazing answer to prayer. Serious Faith Booster at a time when I really needed it. Nathan showing him some stuff in the classroom yesterday. The twins went with us. A very happy and excited boy this morning. He couldn't even eat. He told me, "I'm not sure I can eat all this; I'm just so excited to get to school". 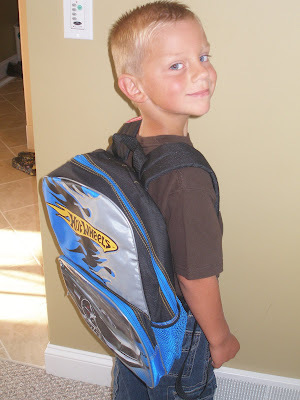 After some guidance from Aunt Paulette and from Mommy and Daddy, he decided that he really didn't need a new back-pack this year. He did have money for it, and we told him he could if he decided he really needed one. We were proud of the decision he made. It wouldn't have hurt a thing if he would've bought a new one, but I think he made a very mature choice. An 8:00am phone call from Daddy this morning. We leave at 8:05. Although this mommy would love to say that his eyes look like they are teary because he just can't handle leaving me, it is actually just that he has really sensitive eyes and I had just taken a picture and so they were still watering. Way to burst my balloon! 8-) It's okay - I want him to want to go. So there you have it ... we are back to school. The twins are fine - although they do keep asking how much longer until he will be home. I miss him - can't wait till he is home. Can not even wait until I hear what he learned today - which probably isn't much since it's first day review. Wow! 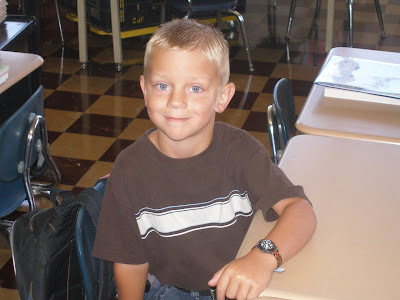 A first grader~time sure flies. Thanks for your comment. I am still working on figuring all this coupon thing out and how to best write a post for it so it may be a while:-}(besides Rob and Carol are hear this week so not so much time! One of my favorite blogs is momeysavingmom.com She has a bunch of great tips on getting started. Another good one is freebies4mom.blogspot.com ALOT of free stuff and deals, you kind of have to weed through it but can get some good deals. He looks so excited! Mollie had her Kindergarten Orientation this afternoon and was so excited. She is looking forward to tomorrow because she gets to go all by herself. :-) I'm sure she'll be ready for me to leave too! Hope Treyton has a great year and that's so neat about his teacher! There are 2 kindergarten teachers at Mollie's school and there was one in particular that I really wanted Mollie to get - and she did! She told me that she actually requested to have Mollie in her class. The Lord works in mysterious ways!! The I'm ready for Mom to leave is so like my boys..lol..Never one tear about going to school! Awww! You were so brave. And isn't is wonderful how God answered your prayer when you took your hands off? PS: Clayton does look like me and my brother, Kevin. He does have his Daddy's eyes tho!!! How hard it must be to let him go! I'm homeschooling Josh and Katie this year -3rd and kindergarten. We'll probably start the first week of September. So wonderful God worked the teacher thing out for you! I still can't believe how big the kids are getting. I still remember the day I got to hold him for the first time. 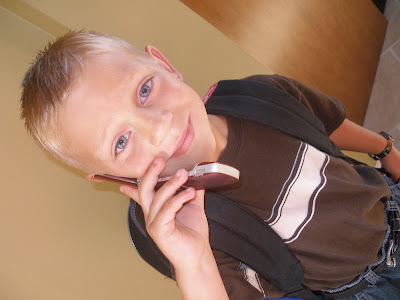 I love his eyes in the picture with him on the phone with Nathan. He still looks absoultly like Nathan. 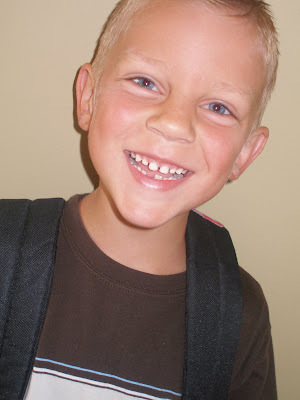 Aww, what a cutie, he looks so excited about starting school! No, I have not changed my number. I'm in the process of getting a new phone because the one I have never works. I don't think I got any so that may be the reason. I don't know if he ever loved me more your his mother. 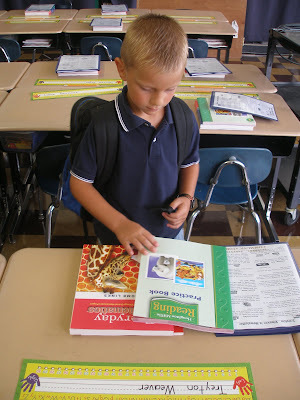 1st grade is a great year for learning new things. He is so cute! 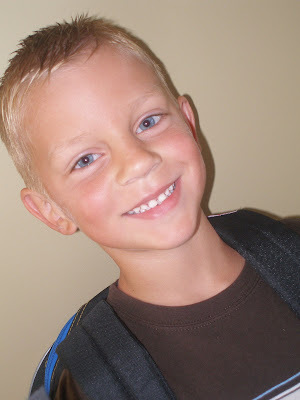 What a handsome first grader!